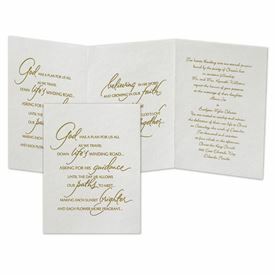 An inspirational message is printed on the first two panels of this natural parchment z-fold invitation to joyfully tell the story of your faith and love. Your wording is printed on the right panel. The verse is only available printed in the lettering shown and will be printed in the same ink color you choose for your wording. Inner and outer envelopes are included. We had selected this beautiful and heartfelt wedding card because of its spiritual message. The card was well liked across our guest list. We were able to get through multiple iterations with the card designers till we felt we got the spacing of the text right. Shipping took a few weeks but was timely. Recommend to all others. The invitations were absolutely classic and beautiful for our Christ centered wedding. We ordered then with navy blue ink to complement the wedding color. They are embossed to fold easily on the pre creased lines; so folding the invites was easy and not a big deal. We are so happy with the quality and thickness of the paper and could not have wished for more. The invites were ordered on Monday and were delivered on Saturday!!!! They were absolutley beautiful and stated exactly what we wanted for those invited. Thank you! I have received many, many compliments regarding these invitations. Absolutely beautiful. When we first got engaged 2years ago, I found Anns Bridal Bargain by just doing a google search. I didnt want the traditional inviations but I wanted something that showed that, this was a union under God. I Love my invitations. I love the wording, the fonts and the quality of the paper and for a VERY GOOD PRICE. I would recommend anyone that are looking for wedding inviations to shop Ann's Bridal Bargain. I wasn't expecting the invitations for 7 to 10 days. I believe they where delivered in 43 to 4 days after purchase. They were package neatly and with instructions. Everything was just perfect. Best Christian Invite at the Best Price! We adore the saying on this invite. In regards to the folding, the invites are creased so it literally takes 2 seconds to fold as they fall into place. The writing is smaller, but we added a ton of words, and loved that we could write what we wanted on the 3rd section. The gold ink is lovely. We found that items go on sale ALL the time! If you have time, keep checking for a few weeks and you'll get a great deal! Overall we're very impressed. Crazy fast shipping, beautiful invites, and packed very well. Absolutely no complaints here! Impressed with the packaging, envelopes in their own little boxes, invites nicely placed in a box with tissue paper, all in one large box! I couldn't believe they were able to print all my invites and get them to me so quickly! These invitations are really beautiful! We wanted an invitation that spoke to who we are as a couple...we found it! I love the price and the message that the invitation conveyed.I wish it would been a little larger. I would've been thrilled if I could've used the shimmer paper. But I like the way the invitation looks. the delivery was fast. I was slightly disappointed with size(too small). But I mounted it on a portrait pocket and it came out perfect. My fiance' and I searched for a very long time for the "perfect" invitation that was affordable but most importantly reflects our love for one another and our faith and love in our God. We were able to tailor to precisely what we wanted it to say on the personalization part. Having the return address printed on the outer envelope and the reply envelope made sending them super easy. I've received so many compliments on the invitation from my guests already in their RSVPs and phone calls. This is definitely one I will keep forever. I am the bride and I ordered our invitations. We wanted a Christian theme, because we understand that it was God that brought us & that will keep us together! This invitation was perfect. The paper was nice & think and print was beautiful! I liked the various options available for the actual announcement section of the invitation--we were able to find a selection from the many selections offered that fit perfectly. The invitations took a little longer than excepted to arrive, but this may have been due to changes that had to be made with the reception cards. However, when they did arrive they were packaged very nicely. I wish that the invitation would have come folded because I ended up having to fold 200 invitation, but overall I really liked them!The customer service was excellent. They did work with me to correct a mistake that had been made, which I greatly appreciated! 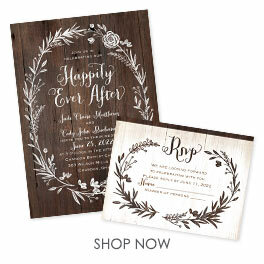 Easy personalization, good color choices for ink and quick delivery! Only con would be that the liner for the inner envelopes don't come in many color choices. This is WONDERFUL!!! Helps set the tone for an elegant affair. The words mean so much. My Wedding Coordinators were carried away when they saw what we'd chosen. Beautiful verse. I've received many complements on it. We didn't have any trouble getting them to fold flat as previous users did. Great card and great value.